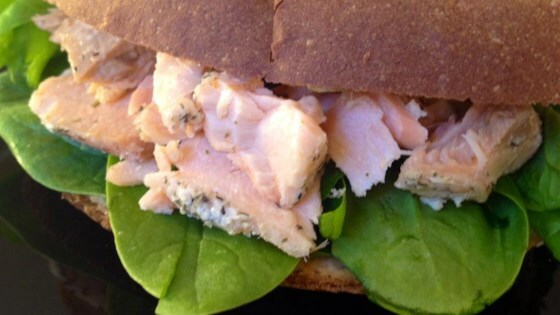 "Simple ingredients make a hearty sandwich using canned salmon (pink or sockeye). The spinach helps keep your toast from getting soggy, especially if you make this in the morning to pack for lunch. Refrigerate the sandwiches up to 24 hours." Place the salmon and thousand island dressing in a bowl, and mash with a fork to combine. Stir in the green onion, cover, and refrigerate about 15 minutes. To make the sandwiches, place 5 whole spinach leaves on two toasted slices of bread, covering as much of the slice as possible. Spread half of the salmon mixture on top of each sandwich, and top with 5 more leaves of spinach. Place the remaining slices of toasted bread on top. Turn leftover creamed spinach into a simple and delicious hot lunch. Super easy and a nice change from tuna salad. I like to add a few more onions. Awesome! Like a plain old tuna sandwich went out and got all dressed up!